APC Volunteer Researcher Patricia Ollerenshaw arranged for two-time Paralympic World Champion Gold medal archer Tony South to visit the APC office in Sydney this week and share his experiences with APC staff. 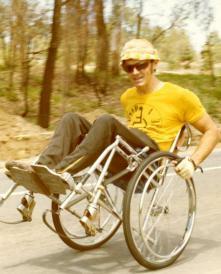 How do you look back on your career as two-time Paralympian who attended the 1968 and 1972 Paralympic Games? In those days, it wasn’t easy. The competition was very tough and the Australian team was very small. There were only 16 Australian athletes who went to the Israel Games in 1968. In my case, the situation in which I have grown up, everything was done the hard way. At the same time I was working, trying to hold down a job with IBM, care for my family including my four disabled kids, then train and keep my life balanced as much as I could. It was extremely competitive to get in the team. From my point of view I probably get more satisfaction out of my success in Israel, than any of your competitors today, because they are not having to go through the trials and challenges that we went through. I remember being told quite specifically, that I had to raise $2500.00, otherwise I wouldn’t be on the plane. There were three of us who did Archery, so at night, we would go to the licenced clubs and put on shows where we would shoot balloons out of my wife’s hand, flames off candles, and we had a Styrofoam dummy where we would put an apple on the head then we’d ask for a volunteer to sit so we could do a ‘William Tell’. To trial it first, we’d put an arrow through each eye and once through the apple. Sometimes we would be out 4 nights a week but that’s the satisfaction. We got there and in my case I achieved what I wanted – the World Paraplegic Archery champion. Can you please us more about your experience at the Tel Aviv Games in Israel in 1968. How were the Israelis as Games hosts? What were the facilities like? What were the conditions like in the athletes’ village? We stayed in a place called the Macabbi Village which appeared to be an entertainment place, in a dormitory that would accommodate 20 people. It was like a hospital, with beds down each side of the room and only one shower recess, no plumbing and only a hole in the floor, so by the time we’d all had a shower the floor would be like a river with six inches of water flowing through the room. We were looked after by young Israeli girls who were in the Army, there was compulsory two year service. It was a great experience, the way they cared for us, with entertainment, showed us around between tournaments. It wasn’t like like today with all the plush accommodation in the Athletes’ Village. Can we talk about your second Games in Heidelberg, West Germany 1972? You mentioned the awe of that first Games in 1968, and experiencing everything for the first time. How much did things differ in 1972? Significantly. I was under so much stress at home with three kids at that time with disabilities, and my wife was under enormous stress trying to cope with them.I had a senior executive job at IBM and with all the time I was away with work and sport, it was fair to say that at that stage of my life I had to decide, ‘what was important in my life to keep a balance’. It was interesting. After the 1972 Games I never had the same level of commitment and with my family challenges I slowly realised that after I competed in Germany, I had not done enough training. By that time, the sport was starting to develop and the guys who came first, second, third at those Games in archery were Germans studying at University with a scholarship for Archery. They had professional coaches, spotters and all kinds of support, whereas the Australian team had to carry all their own gear. Finally, my future in sport did not continue as I recognised that I could not put the time and effort into it. With, Archery in particular, the mind is as important as the physical side. Physically, my bow when pulled back 28 inches [71.12cm], was 42 pound [19.05kg], so when you consider that a person who would shoot 500 arrows in a week, placed a lot of strain on the body. Plus we still had to raise funds and with the conflicting priorities in my life……as much as I’d like to do sport and I’d still love to be doing it, it didn’t fit into my lifestyle objectives “to leave the world a better place and I’ve found it”. In many cases, it’s a very selfish sport. It’s all about me trying to achieve which is good for the rehabilitation stage, but when it becomes a life goal I think that it’s way out of proportion and I was in danger of doing that at the cost of my family, job and everything else. Can I ask about your thoughts and impressions of the Paralympic Movement in Australia in 2015? It is absolutely excellent. As I mentioned before, myself, Kevin Betts, some physios and team of support people helped form one of the first Committees to support disabled sport. We’d meet once a month to talk about what we could try to achieve in the whole movement – how could we get a fairer rating of peoples’ capacity to compete. Some people could not use their hands, others had varying disabilities, and all competing in events not achievable with their disability. I wanted to do field events but I was competing against who were far less disabled than me. We were talking about those issues that needed to be addressed if the Movement could go forward. I spent a couple of years doing that before my life caught up with me and I had to move on. Who else do you remember playing a key role in progressing the Paralympic movement in those early years? Prior to that, when I was competing in the Australian championships, there was a guy by the name of Ross Sutton whom I’m sure you know. He was always beating me but I was getting closer and closer to him as time passed. Later on in a radio interview, Ross was asked who did he think would replace him. He replied: “undoubtedly Tony South, he is going to be the best in the world”. Those two little comments were fundamental in my belief of achieving success, and you ask why do I share that? The young ones really need this encouragement to move along the path of success.